In a previous article, we discussed some common impeller and casing designs. This article will consider what happens when you put the two together. After reading this post, if you’d like to learn more about these types of pumps and other common pump types, check our page about common pump designs. The most common centrifugal pump design is the end-suction pump. This type of pump combines a volute casing with a variety of impeller designs. Most typically, a radial flow impeller would be used, but in certain specialty applications, Francis-vane or mixed-flow impellers may be used. 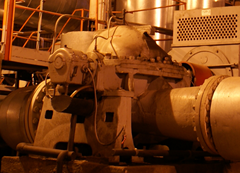 End-suction pumps are used in a large range of applications. Standard end-suction pumps are commonly used in fire suppression, plumbing, HVAC, and municipal water pumping applications. Specialty designs are often used in wastewater, pulp & paper, chemical, oil and gas, and a variety of other industrial applications. Some manufacturers offer a standardized line of end-suction pumps referred to as ANSI end-suction pumps. These types of pumps are built to a common set of design standards and are even dimensionally interchangeable between manufacturers. End-suction centrifugal pumps are particularly popular because they offer a compelling combination of comparatively low up-front cost, acceptable service life, good efficiencies, and design flexibility. 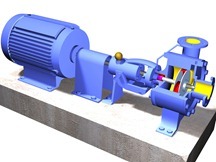 Specialty designs are often fitted with unique impeller designs allowing end-suction pumps to be used in solids-handling applications, such as pumping municipal and industrial wastewater. One particularly popular specialty end-suction design is the submersible pump. The submersible pump is an end-suction design that has been fitted with a motor designed to operate while submerged. This allows the entire pump to be submerged in the liquid being pumped. End-suction pumps, such as the submersibles, which have been designed to handle solids, are often fitted with mixed-flow impellers or specialty impellers such as the vortex or screw impeller. These specialty impellers are designed to handle solids without clogging. The vertical inline pump is very similar to the end-suction pump in terms of general design. The difference is that the casing has been redesigned so that the suction and discharge flanges are in line with each other rather than perpendicular. Vertical inline pumps are commonly used in water and chemical pumping applications but are not typically used in solids-handling applications. They are very common in HVAC and plumbing applications and are growing in popularity in other applications. They offer many of the same positive attributes as end-suction pumps with the added benefit that their vertical design saves on floor space requirements, and their inline flange design simplifies piping layout work. The designs mentioned have so far all utilize a single-suction impeller. The most common pump design that incorporates a double-suction impeller is the horizontal split-case pump. Horizontal split-case pumps are sometimes referred to as between-the-bearings pumps because there are bearings on both sides of the impeller. This is in contrast to the typical end-suction or vertical inline design which generally only includes bearings on one side of the impeller. As a result of the double-suction impeller and between-the-bearings design, horizontal split-case pumps are a more robust and durable design than either end-suction or vertical inline designs. This is why split-case pumps are often selected for applications where pumping duty is expected to be very frequent, and where downtime for pump repair and maintenance must be kept to a minimum. Applications that fit this description are municipal water applications and industrial process applications. While spilt-case pumps are certainly also used in other applications, applications that require extremely dependable performance, and are able to absorb the additional cost associated with this robust pump design, are typically those that specify and procure split-case pumps. Diffuser casings are rarely used in standard horizontal centrifugal pumps such as those listed above. The primary use of diffusers in today’s pumping world is in vertical turbines. True vertical turbines incorporate radial, Francis-vane, or mixed-flow impellers which discharge into a diffuser-type casing. In high-pressure applications, more than one set of impellers and diffusers may be used. Each of set of impellers and diffusers is called a stage. 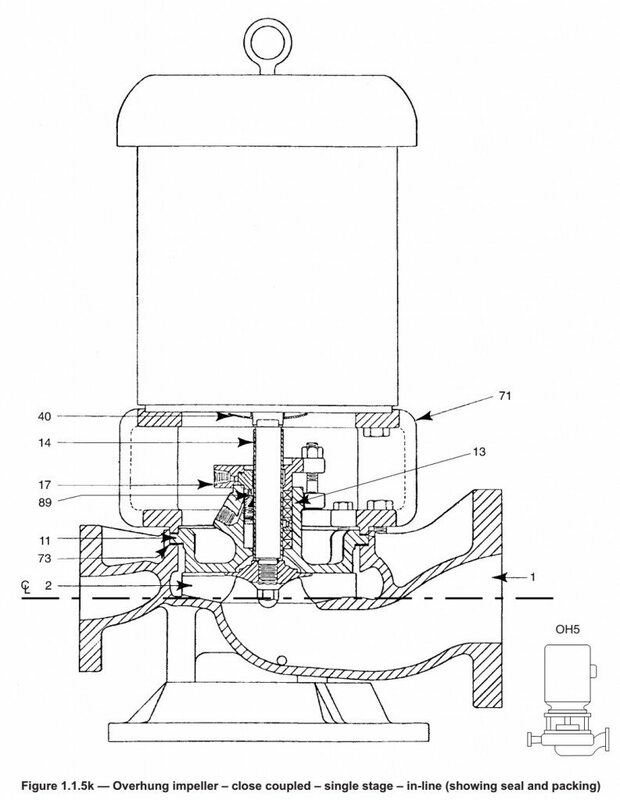 For example, a two-stage vertical turbine would have a suction inlet followed by the first-stage impeller which would discharge into the first-stage diffuser. The water would then flow into the second-stage impeller which would discharge into the second-stage diffuser. The water would then exit the second stage diffuser and flow up the pump column to the discharge point. Vertical turbines with up to 10 stages are common, and designs incorporating 20, 30, or even more stages are not unheard of. The effect of adding stages is that the pump generates additional pressure. Vertical turbines are a very common pump design, and are used in many different applications including raw water intake, municipal water pumping, cooling tower applications, and irrigation applications among many others. Some vertical turbines may be very short while others are be hundreds of feet long depending on the application requirements. There are also specialty vertical turbine pumps for unique applications. One common specialty design incorporates a fully-open mixed-flow or axial-flow impeller design. These types of pumps are often called propeller pumps, vertical mixed-flow pumps, or vertical axial-flow pumps. These types of pumps are high-flow, low-head designs ideally suited to move a large quantity of water at a low pressure. These pumps are rarely staged, and due to their fully-open design, are ideally suited for handling large non-stringy solids. Due to these characteristics vertical mixed/axial flow pumps are routinely used in storm water, raw water, and flood control pumping applications. Another specialty design incorporates a non-clog type impeller into a vertical turbine design for pumping raw sewage or other solids-bearing liquids. 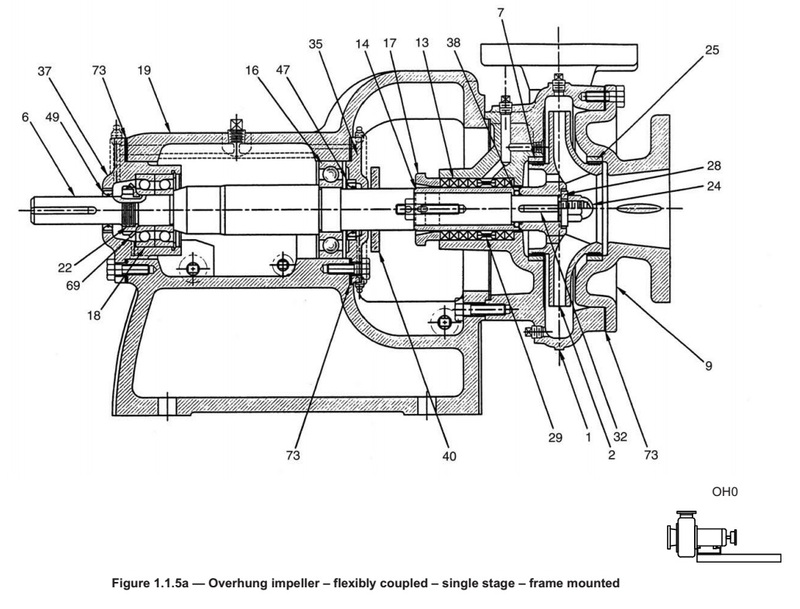 There are many different pump designs. This short list includes the most common designs used in municipal water and wastewater applications, industrial water pumping applications, HVAC, and plumbing applications. 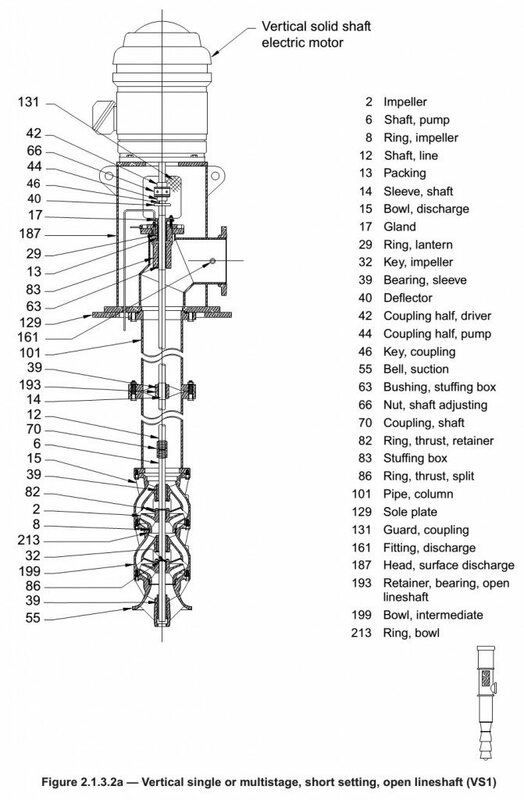 This list is far from exhaustive as many unique pump designs exist and significant variation in the designs listed exists between manufacturers. However, with a general knowledge of these basic pump types a pump professional will have a good handle on the pump designs required by the vast majority of typical pumping applications. Additional detailed knowledge regarding each of these designs can be gained by studying catalog data freely available from many different pump manufacturers. In addition, we have created a series of articles that explore each of these types of pumps in greater depth.